A superconductor exhibits no resistance to electrical current when cooled below the critical temperature Tc, and developing superconductors with the highest possible transition temperatures is currently one of the grand challenges in materials physics. Until now, the highest Tc values have been observed in copper oxide based materials known as cuprates. In fact, cuprates have provided the only examples of superconductors with transition temperatures above the boiling point of liquid nitrogen, 77 K. Xiao-Jia Chen, along with researchers from the Geophysical Laboratory, South China Institute of Technology, and the Max Planck Institute, have unexpectedly found that the superconducting state can be induced under two different pressure regimes in a bismuth cuprate crystal of composition Bi2Sr2Ca2Cu3O10-δ, referred to as Bi2223. This material has a layered structure, with insulating bismuth-oxide layers sandwiching layers of strontium oxide, copper oxide, and calcium oxide (Figure, left). The outermost and inner copper oxide layers have different physical properties resulting in an imbalance of electric charge between the layers. It appears that this unusual two-step phenomenon comes from competition in electronic behavior between different kinds of copper-oxygen layers in the crystal. 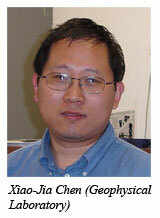 The work is published in the August 19, 2010 issue of Nature. One way of increasing the transition temperature of superconducting materials is to dope them by valence substitution into the parent material. 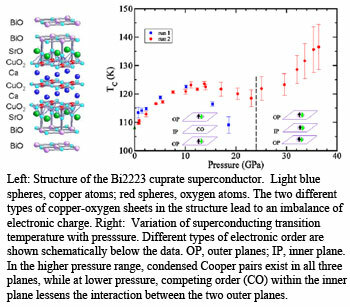 Under normal pressure, the transition temperature of the optimally doped Bi2223 is 108 K. Chen and his colleagues subjected doped crystals of the material to a range of pressures up to 36 GPa, the highest pressure yet for magnetic measurements in cuprate superconductors. The first increase in transition temperature was recorded at 10 GPa, with increasing pressures resulting in lower transition temperatures. Then, surprisingly, at 24 GPa the superconducting state reappeared (Figure, right). The transition temperature rose to 136 K at 36 GPa, which was the highest pressure attained in the experiment. Other research has shown that similar multilayered superconducting materials exhibit different electronic and vibrational behaviors in different layers, and suggests that 24 GPa represents a critical point at which applied pressure suppress es one type of electronic behavior and enhances another, in this case superconductivity [X. J. Chen et al., Nature, 466, 950-953 (2010)].